Co-sponsored by the Minor in Creativity, the Arts, and Social Transformat, Brandeis University Library, the Office of the Dean of Arts and Sciences, the Heller Office of the Dean and Sankofa Events, the Office of Diversity, Equity and Inclusion, the Division of Creative Arts, the Department of African and African American Studies, and the Department of Politics. 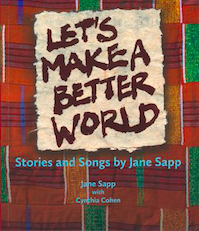 Let’s Make a Better World: Stories and Songs by Jane Sapp is a new resource for music educators, chorus leaders, activists and cultural workers,. 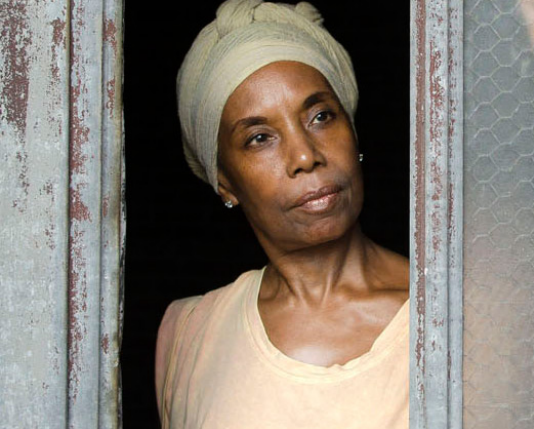 In it, the nationally admired cultural worker, musician, educator, and activist, Jane Wilburn Sapp, shares her approach to social transformation and its roots in African-American musical traditions. In the book, Jane tells the story of her childhood, nurtured by the Black community while living in the brutal world of the Jim Crow South. She describes her participation in the Black Power movement and introduces us to her mentors. She shares 25 songs she has written with young people and sung with people of all ages, and tells the stories behind each song and offers suggestions or teachers and chorus leaders. 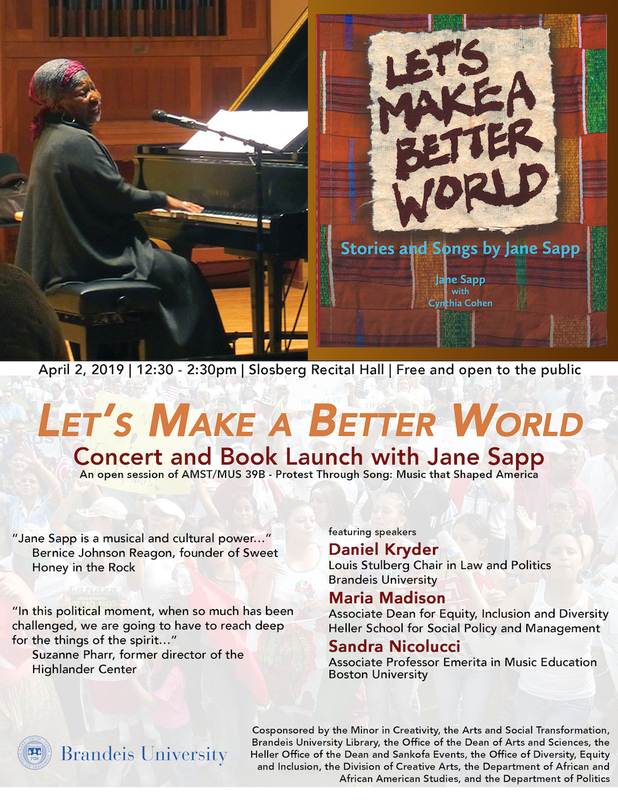 The book also includes scores, and all of the songs can be heard on podcasts where Jane’s approach to cultural work is illuminated through conversations with activists, cultural workers, and music educators. An award-winning Haitian-American educator, organizer, and poet from Boston, Ashley-Rose’s poetry has been featured in The Anthology of Liberation Poetry, alongside the work of Tony Hoagland and Black Arts Movement co-founder Askia M. Touré. She gave one of the first TEDex talks in Boston based on her poem “The Other Side of Ruggles.”As a storyteller, she’s also been featured on PBS’s Stories from the Stage. Ashley-Rose was honored by Mayor Marty Walsh with the OneIn3 Impact Award as one of the most influential people under age 35 in Boston. In 2016 she was awarded Boston’s Extraordinary Woman Award for her work with arts, education, and community development in Boston. A dance artist/educator, certified yoga teacher, and writer, Melissa Alexis (M.F.A. Dance, Sarah Lawrence College) founded Cultural Fabric & The Healing Arts Institute to foster mindfulness through movement in service of healing justice and inclusion. A first-generation Trinidadian-American, her movement research is rooted in exploring the intersection of African, Eastern, and Western perspectives, as well as psychology, social justice, sustainability, and mindfulness studies. Please bring something to write with, paper, and a writing surface (a book or notebook). Sponsored by the Minor in Creativity, the Arts, and Social Transformation (CAST) and cosponsored by the English department. Presentation and Workshop: "From University to Pluriversity: The Fair-Trade/Decolonial Education Model"
Presentation: "From University to Pluriversity: The Fair-Trade/Decolonial Education Model"
Come listen to Daniel Bryan, executive director of The Pachaysana Institute and resident director of Rehearsing Change: Empowering Locally, Educating Globally. 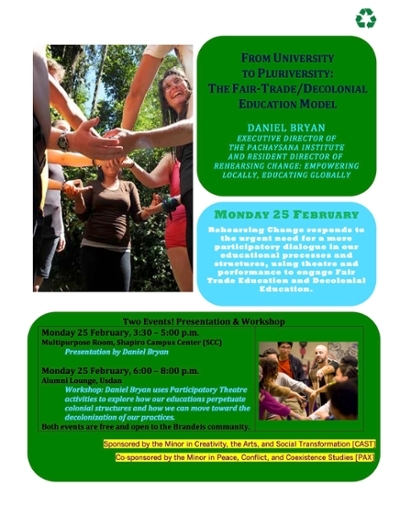 Bryan will be discussing the work of Rehearsing Change, which responds to the need for more participatory dialogue - such as theatre and performance - to engage with education about fair trade and decolonization. View the full flyer. For those interested in studying abroad with Rehearsing Change, the organization is currently accepting applications for the Fall 2019 semester. Participants will spend the semester in two rural communities in Ecuador, where they will live, learn, and create with the communities. The first application deadline is March 15th, with applications accepted until April 15th. Interested students can talk to Bryan more in-depth about the program on February 25th. These events are sponsored by the Minor in Creativity, the Arts, and Social Transformation (CAST). Co-sponsored by the Minor in Peace, Conflict, and Coexistence Studies. Workshop: "From University to Pluriversity: The Fair-Trade/Decolonial Education Model"
Work with Daniel Bryan, executive director of The Pachaysana Institute and resident director of Rehearsing Change: Empowering Locally, Educating Globally, as he uses participatory theatre activities to explore how education can perpetuate colonial structures. Bryan will also be examining how we can move towards the decolonization of our practices. View the full flyer. 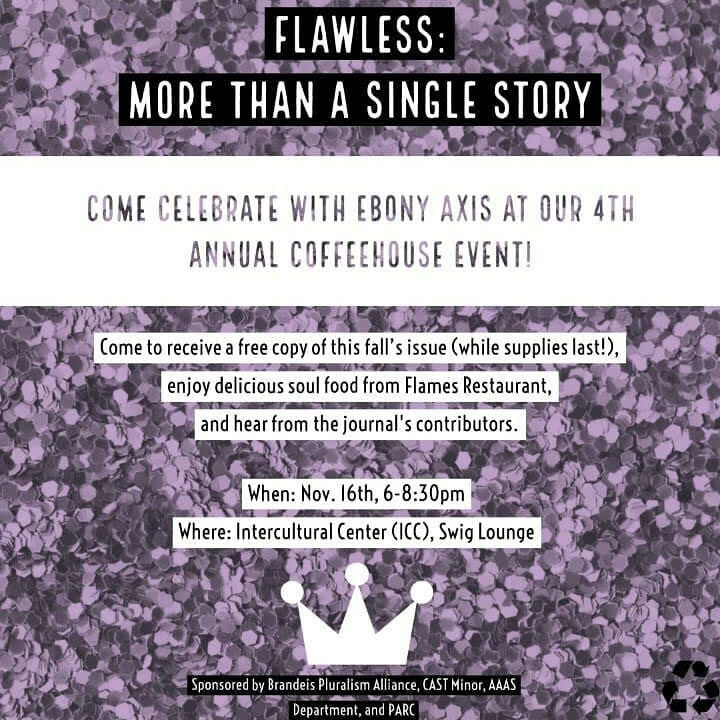 Come eat, listen, and mingle at our annual coffeehouse event in celebration of this year's issue of Ebony Axis. This community journal features the creative work of self-identifying black women in the Brandeis community. Make sure you come to hear from this year's contributors and special guests Poetic Justice, Brandeis' Slam Poetry Team, eat great food from Flames Restaurant, and receive a copy of the journal (while supplies last!). If you would like to volunteer the night of the event, please fill out this form. Make sure to RSVP on Facebook if you plan to attend. We hope to see you there! Sponsored by Brandeis Pluralism Alliance, CAST Minor, AAS Department, and PARC. You're invited to join in an evening of creative response and resilient community building in the face of our traumatically divisive political moment. 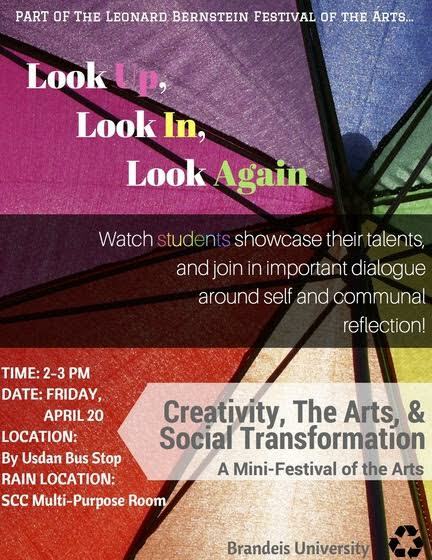 This event is sponsored by the UDRs for the minor in Creativity, the Arts, and Social Transformation (CAST). Joan Morgan is an award-winning cultural critic, feminist author and pioneering hip-hop journalist. Morgan coined the term "hip-hop feminism" in 1999, when she published the groundbreaking book, When Chickenheads Come Home to Roost: A Hip-Hop Feminist Breaks it Down, which is taught at universities globally. Regarded internationally as an expert on the topics of hip-hop, race and gender, Morgan has made numerous television and radio appearances. She has been a Visiting Scholar at The New School, Vanderbilt, Duke and Stanford and is currently a doctoral candidate at New York University. 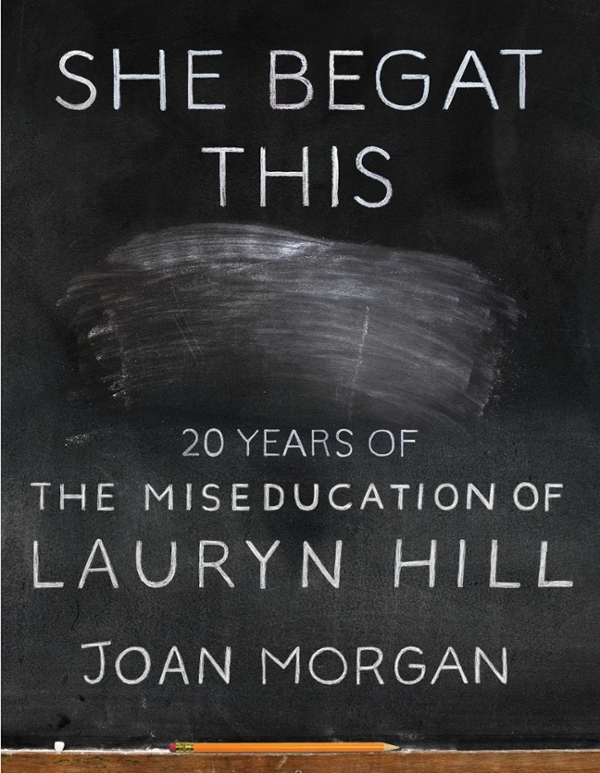 Her most recent book is She Begat This: 20 Years of the Miseducation of Lauryn Hill. This event is sponosored by the Department of African and African American Studies and cosponsored by the Dean of Students and the minor in Creativity, the Arts, and Social Transformation (CAST). The minor in Creativity, the Arts, and Social Transformation (CAST) welcomes the community to a screening of the award-winning film Because of the War, by Toni Shapiro-Phim, produced in conjunction with the Philadelphia Folklore Project. In West Africa and North America, four Liberian women use their music to address injustice and inspire action for social change. By telling the stories of Fatu Gayflor, Marie Nyenabo, Zaye Tete, and Tokay Tomah, the Philadelphia Folklore Project aims to link Liberians of all generations and the general public with some of the most renowned traditional Liberian singers and dancers, in order to deepen understandings of the active , constructive roles artists can take in moments of crisis in the lives of families and communities. 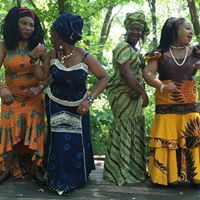 Gayflor, Nyenabo, Tete, and Tomah formed The Liberian Women's Chorus for Change in 2013 to dedicate themselves to addressing issues of Liberian immigrant women through the performance of traditional and newly-composed songs. This is an open session of CAST 150b, Introduction to Creativity, the Arts, and Social Transformation. For more information, please contact ethics@brandeis.edu. Join Harvard Professor and distinguished climate scientist James Anderson for an overview of what we know about climate change today and what this means for human life on planet earth. Pizza will be served. Please RSVP. This lecture is open to all. Read more about Professor Anderson and his work. This event is sponsored by the Mandel Humanities Working Group on Climate Change as a Threat to Human Civilization and Life as We Know It and the Environmental Studies Program (ENVS), and cosponsored by Faculty Against the Climate Threat (FACT), Brandeis Climate Justice (BCJ), Brandeis Peace, Conflict, and Coexistence Studies Program (PAX), the Department of Psychology, Sustainable Brandeis, and the minor in Creativity, the Arts, and Social Transformation (CAST), among others. 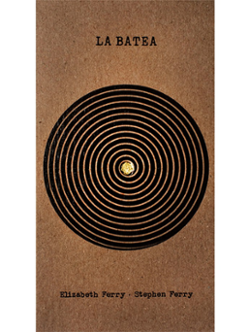 A brother-and-sister team, Stephen and Elizabeth Ferry have produced La Batea, a book exploring the varied lives of small-scale gold miners in Colombia - a group generally thought of as criminals, polluters or abject near-slaves. 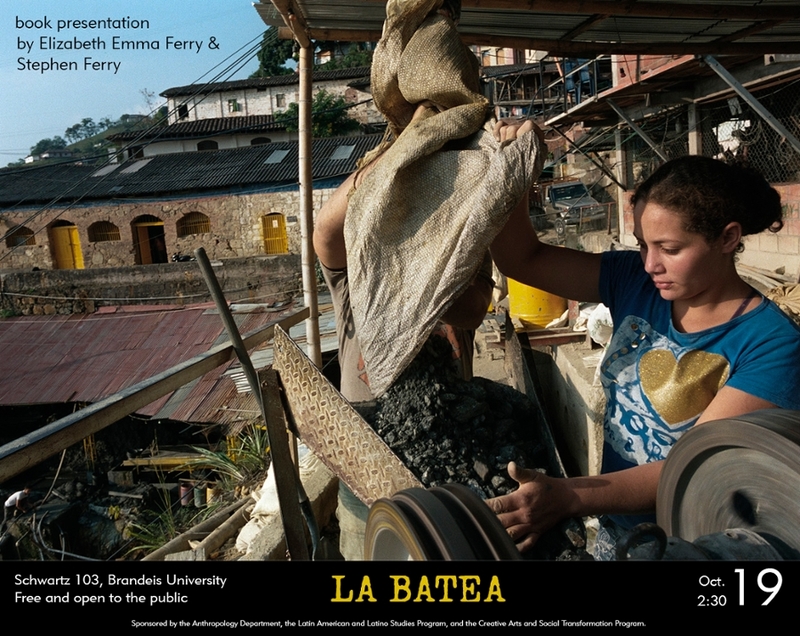 La Batea shows the many histories and contexts of small-scale gold mining that includes violence and exploitation but also long-lived, self-determining anchored communities. Many of the miners we document have been in conflict with transnational gold mining companies that seek to remove them to make room for open-pit projects. The graininess of Stephen’s film, along with the material and construction of the book, work to create a marked sense of texture. In their writing, Elizabeth and Stephen explore different observational genres of documentation, ethnography and poetry. With this emphasis on tactile experience and careful attention, La Batea bends the traditional genres of documentary photography and anthropological writing. Sponsored by the Anthropology Department, the Latin American and Latin Studies Program, and Creativity, Arts, and Social Transformation Program. The Creativity, the Arts, and Social Transformation (CAST) community welcomes students and faculty to a new semester. 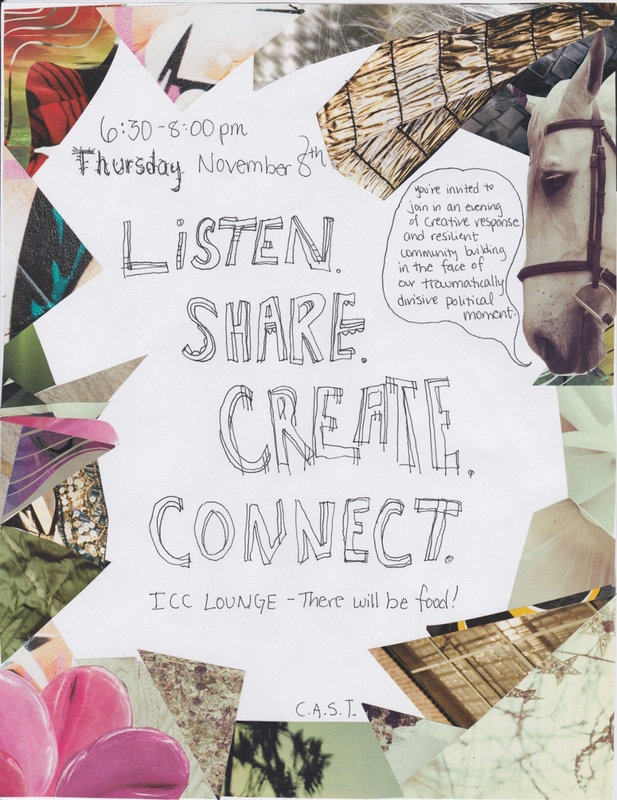 All are welcome to a discussion and reception featuring international artists and peace builders who are visiting Brandeis as part of the IMPACT initiative. This open session of CAST 150b features leading figures in the global Arts, Culture and Conflict Transformation field, including Babu Ayindo (Kenya); Ellada Evangelou (Cyprus); Mary Ann Hunter (Australia); Shahid Nadeem (Pakistan); Carmen Olaechea (Argentina); and Lee Perlman (Israel). Roundtable discussion followed by reception. Please see full biographies of the panelists. View the event flyer. The Summer School is international and designed for undergraduate students from the Humanities, Social Sciences and other disciplines, as well as practicing artists and community workers, interested in attaining knowledge and tools in theatre and performance, as they relate to community. It is hosted by the Department of English Studies of the University of Cyprus in Nicosia (Cyprus), in partnership with Brandeis University's Program in Peacebuilding and the Arts, USA. There are three pillars to the program: morning lectures, covering theory and framing the discussion of theatre in (post)conflict communities, afternoon workshops, providing hands-on experience of three methodologies practiced by groups and individuals in the Cyprus, the Eastern Mediterranean and globally, and the Incubation process, through which the TPCC participants will creatively engage with the material and people of the summer school in order to produce their own creative work. This work will be showcased and TPCC participants can use it in their portfolios. There are also parallel activities, such as discussions, book presentations and play attendance. Visit the program website to learn more and register. 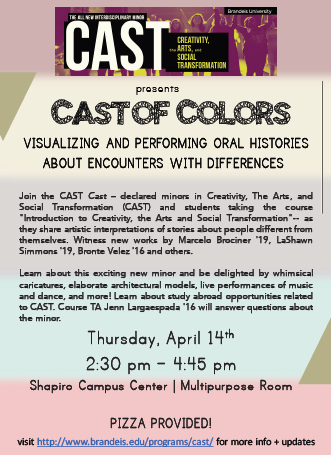 The interdisciplinary minor in Creativity, the Arts, and Social Transformation (CAST) will hold its annual Mini-Festival of the Arts and Social Justice on Friday, April 20, during the Brandeis University Festival of the Arts. Our mini-festival will be an interdisciplinary array of art and social change, featuring collaborations from CAST students working in the creative arts, humanities, and social sciences. The Festival of the Creative Arts at Brandeis was founded in 1952 by the American composer, conductor, and Brandeis faculty member Leonard Bernstein. This year, from April 15th to the 28th, Brandeis will celebrate the centennial birthday of the legendary artist, showcasing music, dance, theater, film and artwork by Brandeis students, staff, and alumni. The festival is dedicated to the belief that "the art of an era is a reflection of the society in which it is produced, and through creative endeavors the thoughts and expression which characterize each generation are revealed and transformed.” In this spirit, CAST will host installations and performances focusing on art and social change. Please join us on Friday afternoon, April 20th, in the Shapiro Campus Center (SCC), MultiPurpose Room as we question, reflect on, and envision the meaning of social transformation through creativity and art. We think you will be thrilled with the thoughtfulness and the creativity of students’ performances and exhibitions. Without photographs, drawings, or well-written description, science can be difficult for a general audience to fully understand. Artists and writers can't explore the world's particularities without understanding them. Information and inspiration feed one another. Join us for a panel discussion of how art, science, and activism can converge. Panelists include a whale biologist trained in scientific illustration, the editor of an anthology of Eco-Justice poems, a naturalist who lectures on expedition ships, and a citizen science advocate. 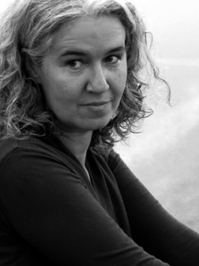 Melissa Tuckey is a co-founder of Split This Rock, where she currently serves as eco-justice poetry project coordinator, and editor of Ghost Fishing: An Eco-Justice Poetry Anthology (U. Georgia, 2018). Elizabeth Bradfield, a poet and Associate Professor in the Brandeis Creative Writing program, works as a naturalist and marine educator on expedition ships around the world. Her poems and essays engaging science have been published in The New Yorker, Orion Magazine, and elsewhere. Colleen Hitchcock is an Assistant Professor of Ecology in the Biology and Environmental Studies program and an active participant and promoter of a diversity of citizen science research. She is member of the 2018 City Nature Challenge: Boston Area steering committee which seeks to document and understand urban biodiversity through active collaboration between the public, educators, and scientists. This event is co-sponsored by the Creative Writing Program and the Creativity, the Arts, and Social Transformation (CAST) Program. We are excited to announce the opening of our new CAST Resource Room, Monday, March 12, at 5:30 p.m., in conjunction with the 20th anniversary celebration of the International Center for Ethics, Justice and Public Life, where it’s located. The first space of its kind for CAST and Creative Writing students on campus, the Resource Room will be a place to meet and collaborate on projects or work individually. Designed and implemented by CAST senior Marcelo Brociner, the Resource Room is filled with comfortable chairs, a computer and desk, and a bookshelf of CAST-related books, movies, and other materials for use and inspiration. It is a welcoming, calming space that offers students a place other than the library to get work done and tap into their creativity. Helping design the space, and serving as mentors, have been Elizabeth Bradfield, Associate Professor of the Practice of English and Co-Director of the Creative Writing Program, and Kristin Parker, Deputy Director of the Rose Art Museum. Both are also members of the CAST Advisory Committee. The Resource Room is located in Room 327 in the Ethics Center, which is on the third floor of the Abraham Shapiro Academic Complex (ASAC, the building right across from the Heller School and next to the Mandel Humanities Center). Do you have suggestions for books or films you’d like to see in the room, or do you have any items you’d like to donate? Please email Marcelo Brociner at marcelotuto@gmail.com. 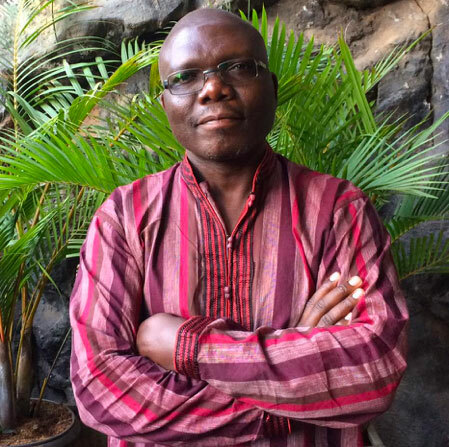 From March 6 – March 12, Dr. Babu Ayindo engaged members of the Brandeis community in activities and conversations on questions surround decolonization and arts-based peacebuilding. In addition to sessions with members of the CAST advisory committee and students, he will lead sessions open to the Brandeis community. View the full flyer of events and view video recording. A generous gift from the Max and Sunny Howard Memorial Fund supported Babu's residency at Brandeis. Kevork Mourad will perform live painting during Home Within, an ongoing reflection on the Syrian revolution and its aftermath, with the acclaimed Syrian jazz clarinetist Kinan Azmeh. The performance by two socially committed master artists will be preceded by a talk by Boston Globe music critic Jeremy Eichler. 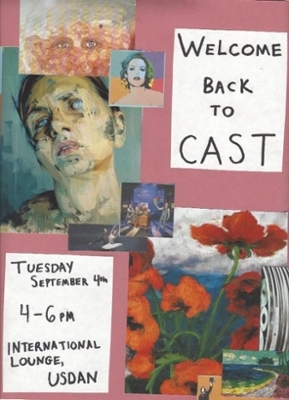 CAST students who do not have a free pass as creative arts students can arrange for the $5 student price to be waived. Contact Sarah Terrazano at sterrazano@brandeis.edu. Tickets required through the Brandeis Box Office. Join a riveting evening with Dorit Rabinyan, one of Israel’s most acclaimed young novelists. The author will discuss and sign copies of her international bestseller, the award-winning All the Rivers, the controversial lover story between an Israeli writer and a Palestinian painter. Ebony Axis is a poetry zine for Black women founded by LaShawn Simmons '18, published with help from a CAST grant. It features poetry, narratives, and illustrations that showcase the experiences and challenges of Black women, and uplift themes of self-love and joy. This year marks the third installment of Ebony Axis, and is also special because Kimberlé Crenshaw – the acclaimed scholar who coined the term “intersectionality” – will be in attendance. She will be at Brandeis and at the Ebony Axis launch as part of her Gittler Prize residency. Alicia Suskin Ostriker, a renowned poet and critic, will be at Brandeis this month for two highly anticipated events. Ostriker has published 15 volumes of poetry, including The Old Woman, The Tulip and the Dog, the National Jewish Book Award winner The Book of Seventy, and The Book of Life: Selected Jewish Poems 1979-2011. She has received the Paterson Prize, the San Francisco State Poetry Award, the William Carlos Williams Award, and has twice been a finalist for the National Book Award, among other honors. As a critic, Ostriker is the author of the pathbreaking Stealing the Language; the Emergence of Women's Poetry in America, and other books on poetry and on the Bible. Alicia Ostriker will share some of her poems stemming from an engagement with the Holocaust (one example below). An open discussion led by Dawn Skorczewski, who is teaching "Writing the Holocaust" this semester, will follow. Alicia Ostriker will read from her work. This event is co-sponsored by Creativity, the Arts, and Social Transformation; Women’s, Gender, and Sexuality Studies; and Hadassah-Brandeis Institute. A public screening of the film "Third Ward TX" will be held as part of Prof. Cohen's CAST 150b intro course. Third Ward is a historically black neighborhood in Texas where Project Row Houses is breathing new life into an inner-city community by converting the neighborhood's row houses to represent its strong legacy of history and culture. The Meet the Minors event will feature artwork and presentations by current CAST minors, and students and faculty will be available to talk about the department and enrolling in the introductory course. 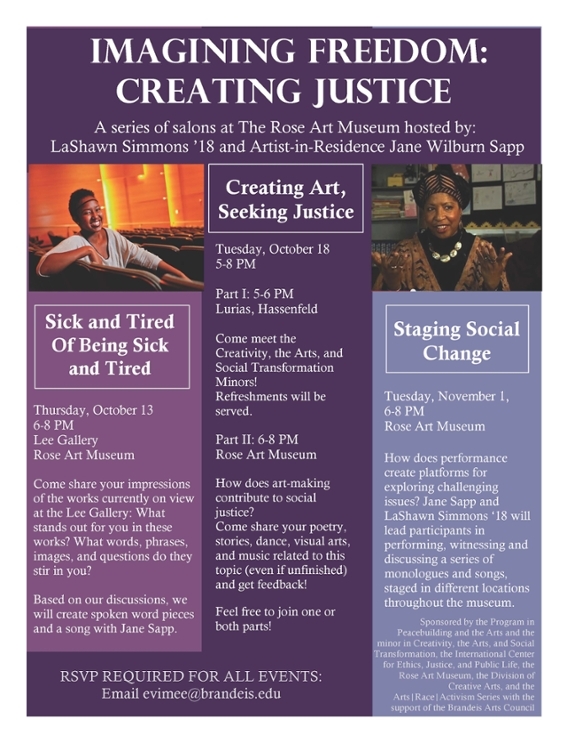 Anyone interested in the intersection of art and social change should attend! A presentation on Olanrewaju Tejuoso’s residency at the Village of Arts & Humanities, a community-based arts organization in Philadelphia. This internationally recognized Nigerian artist, focuses on themes of remembrance, memorialization and transformation. Germain Ingram discussed the intentions of the project, the opportunities and challenges of this arts-driven community engagement, the short-term and potential impacts of the project, and the lessons learned. "Sick and Tired of Being Sick and Tired"
The first event in the series focused on visual art. Attendees shared their impressions of the works on view in the Lee Gallery: Based on the discussion, spoken word pieces and a song were created with Jane Sapp. Attendees shared their art works and received feedback from other artists in our community. The final event engaged participants through interactive performances of monologues and songs! Explored were the songs and stories which surrounded the passage of the Voting Rights Act in 1963, and what actions we can take in the face of the 2013 Supreme Court decision that annulled the key provision of the Voting Rights Act and "put a dagger into the heart" of the law. 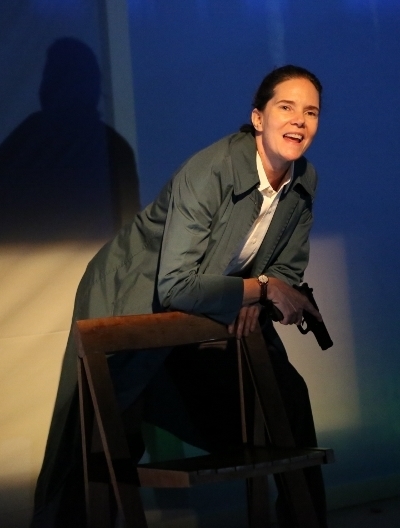 Performance by Marietta Hedges of Catherine Filloux’s Selma ’65, a one-woman play retelling the complex story of Viola Liuzzo, a white voting rights activist who was killed in Selma in 1965, and the FBI informant who was with the Klan the night she was assassinated. Read reflection from Brontë Velez '16 on the event series. 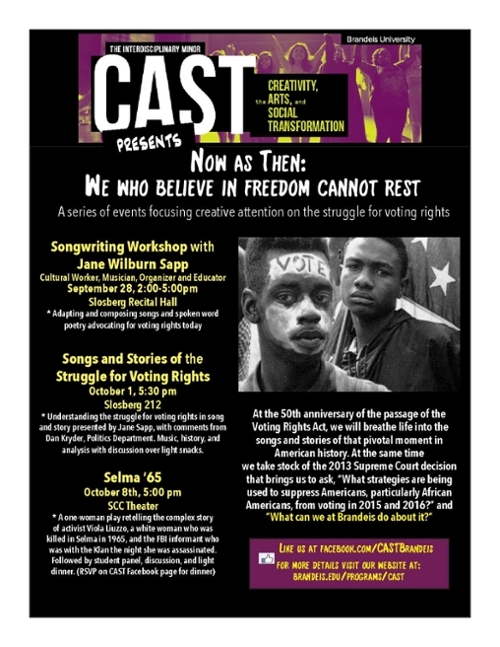 What can we learn from the songs and the stories of those who participated in struggle for voting rights in Selma in 1965? What strategies are being used to suppress Americans, particularly African Americans, from voting in 2015 and 2016? What can we at Brandeis do to reclaim and strengthen voting rights today? Presented by the program in Peacebuilding and the Arts and the minor in Creativity, the Arts and Social Transformation. A Program of the Leonard Bernstein Festival of the Creative Arts "Find Your Light." The annual Festival of the Creative Arts showcases nationally acclaimed performers and visual artists together with music, dance, theater, film and artwork by more than 300 Brandeis students and alumni. Acting Together on the World Stage: "Asking Toward the Light"
The screening of the award-winning, Brandeis-produced, hour-long documentary, Acting Together on the World Stage: Performance and the Creative Transformation of Conflict, which features courageous performance from conflict regions around the world, was followed by conversation with film-maker Allison Lund, Center associate Jane Wilburn Sapp and Associate Professor of English and Women’s and Gender Studies Thomas King and joined by students in the CAST minor. Students from the Introduction to Creativity, the Arts and Social Transformation shared scenes, poems, songs and images based on oral history interviews with people different from themselves. 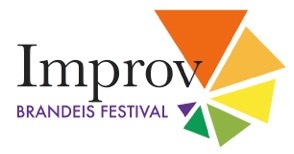 An exploration of the many ways improvisation enlivens the arts and sciences; inspires individual and group creativity; and encourages cultural innovation. The Festivals opening discussion was on “Improvisation and Social Transformation” panelists included Tom Hall (author of “Free Improvisation: A Practical Guide”) and Cindy Cohen (director of the program in Peace building and the Arts).